The largest chocolate manufacturer in the United States currently is Hershey's, or The Hershey Company. Originally called the "Hershey Chocolate Company," the famous brand was founded in 1894 by Milton S. Hershey in Pennsylvania. In his earlier years, Hershey was a caramel manufacturer, but he later realized that chocolate was a better investment. After tweaking some recipes and refining the chocolate manufacturing process, the "Hershey's Kiss" was released, which is a cone-shaped chocolate wrapped in foil with a paper ribbon twirled at the top. Later, Hershey released Mr. Goodbar, which is a chocolate that contains peanuts, and Krackel, which includes crisp rice. 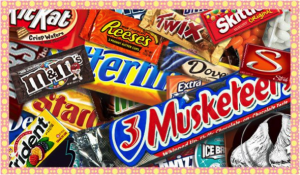 Hershey is also famous for Almond Joy (a coconut center topped with an almond and covered in milk chocolate), Twizzlers (flavored licorice), Kit Kat (a chocolate-covered wafer biscuit) and York (a peppermint patty covered in dark chocolate). Harry Burnett Reese, a worker at the Hershey factory, invented the famous Reese's peanut butter cup in 1941. Since the peanut butter cup did not require as much sugar as most candies at the time, and considering the rationing of sugar during World War II, Reese made this the focus of his production when he built his own factory. Reese sold his candies at local shops in the Lancaster, Pennsylvania area, but dubbed them as "made in Hershey." After Harry Reese's death, Hershey's acquired Reese's candies. You can visit the Hershey factory in Hersey, Pennsylvania and learn how their popular products are made. While visiting, you can also go on some rides at Hersheypark, a chocolate-themed amusement park. Mars was founded by Frank C. Mars and his wife, Ethel V. Mars in 1911 in Tacoma, Washington. Their son, Frank Mars, introduced the Milky War bar in 1923, which was sold as a "chocolate Malted Milk in a candy bar." Frank moved the company to Chicago, Illinois, which is where the main plant is located today. However, unlike Hershey, Mars factories are generally not open to the public. Other confections manufactured by Mars include, but are not limited to, M&M's (tiny candy-coated chocolates stamped with a white "M", Twix (a cookie wafer layered with caramel and coated in milk chocolate), Snickers (nougat topped with caramel and peanuts and covered in milk chocolate), and Skittles (chewy, fruit-flavored candies stamped with an "S"). Mars also produces non-confectionary items such as Uncle Ben's Rice, pet foods including Whiskas and Pedigree brands, and Combos (crunchy, cylinder-shaped crackers, tortillas or pretzels filled with different flavored fillings such as zesty salsa or jalapeno cheddar). One of Mars's subsidiaries is the "Wrigley Jr. Company," which is largely known for selling chewing gum. Its products include Juicy Fruit, Spearmint, Hubba Bubba Bubble Tape, 5, and Big Red. Sam Altshuler founded "Annabelle Candy Company," otherwise known as Annabelle's, in 1950, which is named after his daughter. Their candies include Big Hunk (a bar of roasted peanuts smothered in nougat), Abba-Zaba (a taffy bar with a peanut butter center), U-No (a chocolate truffle bar with almond bits), and Rocky Road (a bar with marshmallows, milk chocolate, and cashews). Although Annabelle's candies are not sold as widely as those of Hershey or Mars, their products are quite popular on the West coast.